Fastest qualifier Unrestrained heads a field of 10 3-year-olds entered back in Sunday’s 350-yard, $36,575 AQRA President’s Open Spring Derby at Turf Paradise. PHOENIX, AZ—APRIL 10, 2018—Cristina Salas’ Unrestrained, a gelded son of Kiddy Up and the fastest qualifiers, heads a field of 10 3-year-olds entered back in Sunday’s 350-yard, $36,575 AQRA President’s Open Spring Derby at Turf Paradise. Unrestrained made his first start outside of California on March 31, when he scored a half-length victory in the last of three trials. A $16,000 claim by his current connections at Los Alamitos on January 11, the California-bred gelding has earned $22,341 from eight outs. Unrestrained drew post 5 and will be ridden by Jake Samuels for trainer Jesus Olivas. First Lady Perry, a daughter of champion Mr Jess Perry trained by John Allred for owner Scott McDaniel, drew post 9 and will be ridden by Mark Jasso. 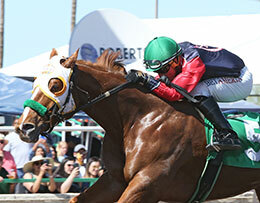 First Lady Perry ended her 2-year-old campaign with a victory in the 400-yard AQRA Turf Paradise Futurity.